Seragledin was in Egypt during the recent revolution and she joins host Frank Stasio today to talk about her home country's past, present and future. Growing up in Egypt, Samia Serageldin didn't think about becoming a writer. She was more worried about the fate of her family whose political activity set them against the ruling parties under Nasser, then Sadat. She married and moved to London at age 20 with her husband. Except for two brief years of hopeful return to Egypt in the late 1970s, Serageldin has been an expatriate, living in Michigan, Massachusetts and North Carolina. 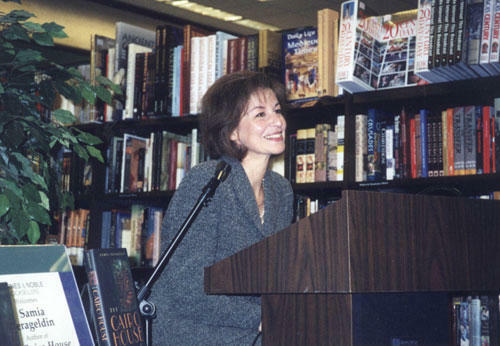 Her autobiographical first novel, “The Cairo House,” was published in 2000 and chronicles the rise and fall of a class of Egyptians caught between Western and traditional influences. Her subsequent books, “The Naqib’s Daughter” and “Love is Like Water,” also focus on Egypt.